All of your weeds can all be composted, including seeds & tubers (except Montbretia & Watsonia corms that you can bake in a different system or dry and use as fire lighters. This hot composting method will compost down your weeds in about 3 months. This system needs to be done at one time. It relies on collecting and storing materials until you have sufficient material to fill an whole bin; you will need about 35 of the small weed bags plus your kitchen scraps (see steps 5 & 6). Do not keep adding to your bin. It is designed to generate sufficient heat to break down all material. It is the proportions of materials and the bulk that enables this process to work. 1 cubic metre is the smallest system that will work. Dead dry weeds (carbon), and/or shredded paper (see step 5). Fresh green weeds & kitchen scraps (step 6) . It can take a good half day to assemble/fill a bin. Ideally, locate your bin somewhere that will benefit from the nutrients that will leach into the ground — eg under a fruit tree, upslope of your vegie garden, not near bushland or a creek. A spot with some wind protection is ideal — eg from a fence or shrubs. The minimum size of compost needed to generate sufficient heat is 1 cubic metre; ie 1 m x 1 m x 1 m high. But the larger it is the better. Steel mesh with 50mm X 50 mm squares is an ideal material and comes in sheets of 2000 x 1200. Cut two sheets into halves, to give yourself four panels of 1m x 1.2m. Then wire three sides together with tie wire, leaving the front one open for now. This will allow you to start filling the bin easily without straining your back. Lay down a layer of sticks or loose material that will provide aeration. Prop a temporary barrier in front of the ‘open door’ about 500 mm high to keep the contents in place. This temporary low ‘front door’ will allow for ease of piling till it is about half full. Some props will be needed to hold it in place: bricks, rocks or full kitchen scraps buckets. Add a layer of dried vegetation about 250mm thick. This can be dried weeds, shredded paper, dried leaves or wood shavings.To dry out weeds from site they will need to be stored off the ground and in containers/bags that don’t trap the moisture. Add a layer of green material about 150mm thick — ie fresh weeds and vegetable scraps. These will be the weeds mostly recently collected which are still green, such as weed grasses. Green kitchen waste needs to be stored carefully to ensure it doesn’t attract animals. Do not include meat or fats. Add a thin layer of accelerant materials about 50mm thick — chook manure, grass clippings, comfrey, yarrow, urine, dolomite, seaweed. When bin is about ½ full wire on the front panel and remove the temporary barrier. 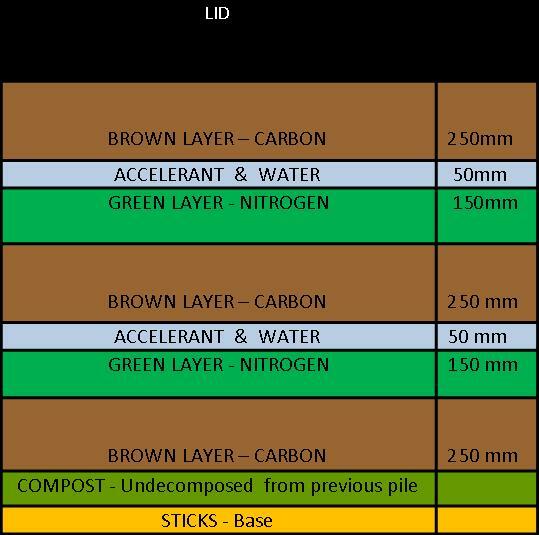 Continue to repeat steps 5, 6, 7 & 8 until the bin is full; finish with the carbon layer. It is best to overfill it as the contents will pack down within a day or two. It is useful to have something for the first few weeks to stop the top layer from blowing away, but still lets the rain in: hessian bags, old cotton clothes, or branches. Whilst your bin needs good air flow, it works best if the heat can also be retained. Shade cloth or sediment control fabric works well to cut down the cooling effect of breezes. It is important to hang out the weed bags to dry for a few days, then store for reuse. Allow time to clean out and dry kitchen scraps buckets. Next is you; you will be a bit smelly too! Don’t worry if your new compost bin is smelly at first; this will go in a day or so. The bin should now be left alone. Adding to it or aerating stops it working. After about three months it should be ready to use. There will be some materials at the edges that need to be put aside to go in the next bin. Take off the front panel, so it is easy to get at. You can then keep the bin in this location or move it; it is easy enough to move with the three panels connected. When you have collected enough material you can start again .